Three titles offer an in-depth exploration of the teachings of this bestselling author. Meditation for Beginners: Jack Kornfield teaches this ancient practice in its purest form, making meditation easy to understand and practice for even those with no previous experience or spiritual context. Clearly articulated and skillfully presented, Meditation for Beginners is designed to bring the peace and power of mindfulness into our everyday lives. An excellent resource for anyone who has ever thought about learning to meditate but didn't know where to start. Buddhism for Beginners: At the heart of all Buddhist wisdom lies one astonishing truth: that a way out of suffering and into a more deeply fulfilling life is not a myth, but a reality available to you the moment you open your eyes through the power of skillful inquiry. 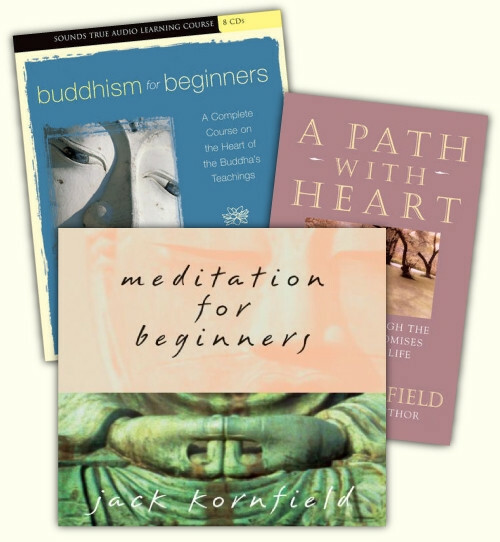 With Buddhism for Beginners, Jack Kornfield invites you to experience for yourself the gifts of this vast spiritual tradition. Created specifically to address the questions and needs of first-time students, this full-length retreat on audio offers an ideal way to learn Buddhism's essential principles and insights. A Path with Heart: A definitive guide to the practice of traditional mindfulness in America today. On this audio edition of his landmark book, Kornfield teaches the key principles of Buddhism's cherished vipassana (insight) tradition and puts them into direct service, with the unique needs of the contemporary seeker in mind.